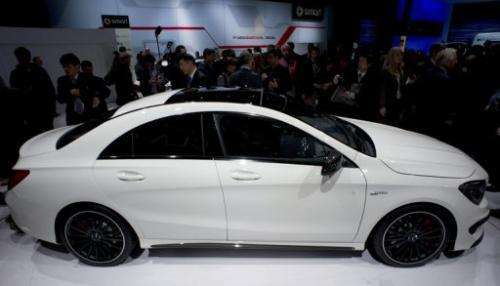 The new Mercedes-Benz CLA 45 AMG is introduced at the New York International Auto show March 27, 2013 in New York. EU Industry Commissioner Antonio Tajani gave France some succour and Germany's Daimler cause for concern Tuesday in a row over new cars that Brussels fears were produced in breach of EU rules. EU Industry Commissioner Antonio Tajani gave France some succour and Germany's Daimler cause for concern Tuesday in a row over new cars that Brussels fears were produced in breach of EU rules. The German automaker has yet to apply European Union standards imposed in January limiting air conditioning coolant to a type deemed by the industry more environment-friendly. As a result, France has blocked the sale of certain A, B and CLA-class models, in contravention of separate EU rules governing the free movement of goods across the single market of 28 states and half a billion consumers. But ahead of potentially heated Brussels talks on Wednesday among national experts, Tajani said that a "preliminary" European Commission analysis had ruled that France was entitled to block for sale cars that do not conform. "Currently, in the European market, there are vehicles produced by this manufacturer [Daimler] that, according to the preliminary Commission analysis, are not in conformity with their type-approval," he said. "Non-conform vehicles cannot be sold or registered in the European Union," he underlined. Since January 1, EU norms demand that car makers use a refrigerant called R1234yf. But Daimler is sticking to an older coolant, called R134a, as it claims studies have shown that the new gas catches fire more easily and puts cars at a greater risk of explosion in case of a crash. The makers of R1234yf reject Daimler's claims. But in Germany, the auto giant was given special permission to keep using the older gas, despite initial approval by the German Automakers Association, VDA, of which Daimler is a member. Germany has until August 20 to answer queries from the European Commission, Brussels having another 10 weeks thereafter to decide whether to launch formal legal action. Daimler argued that some of the cars blocked in France were made during a grace period, a point Wednesday's talks will attempt to resolve.